“Make no little plans; they have no magic to stir men’s blood…” said Daniel Burnham back in 1907. Well, Boston sure wouldn’t have disappointed the famed architect and planner of cities with its ambitious new plan to be 100 percent carbon free by 2050. 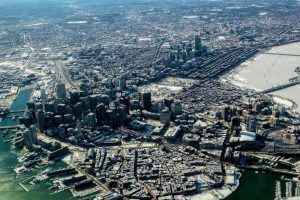 On the heels of Massachusetts’ commitment to have 80% of electricity supplied to the state come from zero-carbon fuels by 2050, Boston is upping the ante. 29% of Boston’s emissions come from the transportation sector, and 75% of those emissions from private passenger vehicles. The technology to make all of these changes already exists, and should become cheaper. Making these changes should also create jobs, lower utility bills, and increase home values, while making the city more climate resilient. Good for Boston for laying down the gauntlet. At Solaflect, we often talk about an average family’s overall energy usage breaking out as roughly 40% transportation, 40% heat, and only 20% general household power usages. Traditionally, solar has really only targeted that 20% slice, but with the increasing availability and quality of electric vehicles and mini split heat pumps, those two 40% slices of the pie are where the sea changes in electrification are coming. And where does all that clean electricity come from? Well, at least for those who have the space, and place a value on simply paying less for electricity, let alone solar – there’s the Solaflect Tracker.